White labeling is simply reselling a product under your own brand. The company providing the service lets you put your own company or product name on the product you resell. It's a great way to add strength to your branding and depth to your customer offerings without headaches and overhead of providing the backend infrastructure yourself. Email and SMS marketing tools, online backup solutions, web hosting, and search engine marketing, are just a few of the many options available. 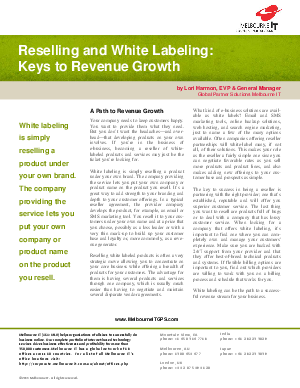 Read this article to find out how reselling white-labeled e-business products can be a successful revenue stream for your business.